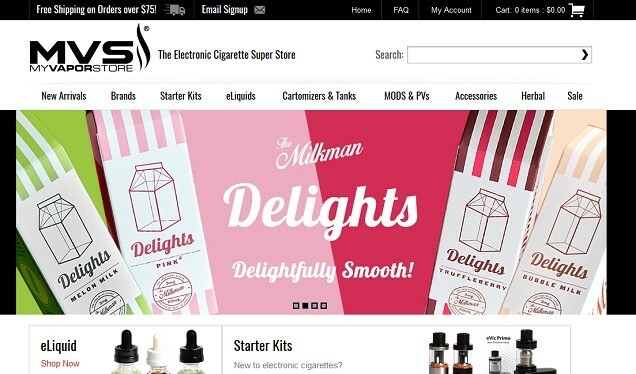 Best Online Vape Stores of 2019 - Top Rated Vape Shops in the U.S. Brick and mortar vape stores are everywhere these days, but many vapers still choose to buy vapes online for the wider selections and the likelihood you’ll be able to get a better deal. Finding the best online vape stores isn’t easy though. Anybody can start a store, so how do you know which ones are reliable? How do you know you’ll be getting a good deal? Which stores carry the biggest selections of vape gear or e-juice? Which stores can you trust to ship your products out quickly and provide great customer service if you need anything? We’ve put together this list of the best online vape shops to help you answer these questions. Vape Wild is a well-known company for their excellent range of affordable e-liquids, but they have a pretty impressive vape store as part of their site now too. It might not be the very best online vapor store you’ll find, but they carry an impressive range of mods, sub ohm tanks, RTAs, RDAs, spare coils, drip tips, batteries, chargers, accessories and much more. In addition to their own extensive line of e-juice, they also offer juice from other companies including Beard Vape Co, Cosmic Fog, Charlie’s Chalk Dust, Element, Kilo, Space Jam and others. Finally, you can also pick up supplies for DIY mixing at the store. If you’re making a purchase from the US – or any US territory outside the continental US – you get free shipping on any order over $30, with an impressive 24-hour turnaround. For international customers, anybody placing an order over $50 gets $10 off shipping costs. With such a great selection, good prices and a great shipping policy, it’s easy to see why Vape Wild ranks as one of the best online vape stores you’ll find. You can visit Vape Wild’s store here. As the name suggests, the 9th best online vapor store caters mainly to UK vapers, but they have an excellent range of gear and e-juice and also ship internationally. The online vape store carries e-juice from a huge range of companies, including ANML Vapors, Cheap Thrills, Cuttwood Vapor, Dinner Lady, Element, Five Pawns, Mad Hatter, Nick’s Blissful Brews, One Hit Wonder, the Milkman and many more. There’s also an impressive selection of sub ohm and non-sub ohm tanks, RDAs, RTAs, rebuilding supplies and pre-made coils on offer, covering most of the big-name brands in the industry, such as Smok, Aspire, Uwell, Kanger, Wismec, Wotofo and more. They offer both mechanical and variable wattage/variable voltage mods, and plenty of batteries in the most widely-used sizes. Finally, there are chargers and accessories on offer too. In short, UK E-Cig Store offers pretty much everything you could need from a vape shop, and offers free tracked 48-hour delivery on orders over £20 within the UK. For other countries, your shipping cost is calculated based on your specific location and order. If you’re in the UK, it’s easily one of the best online vape shops there is, and for anybody outside the UK it’s still worth checking out their selection to see if you can get a better deal. Visit UK E-Cig Store here. Mt. Baker Vapor’s online vape shop is another example of a company that started out mixing and supplying their own-brand e-juices quickly developing into one of the best vape websites in the industry. As well as their own e-liquids, they also offer juices from a huge selection of brands, including 13 Floor Elevapors, Black Label, Charlie’s Chalk Dust, Mod Milk, NJOY, POET, the Neighborhood and many more. For hardware, Mt. Baker Vapor is also a great place to buy vapes online, with a massive selection of regulated, unregulated and temperature control mods, as well as more basic vape pens better suited to new vapers just switching from smoking. As well as this, they offer a small selection of rebuildable devices – mainly RDAs but also an RTA – and a nice range of sub ohm tanks and more basic clearomizers. Finally, they also offer plenty of accessories, including batteries, chargers, drip tips and supplies for rebuilding. Mt. Baker Vapor offers free domestic shipping (via USPS) on any orders over $50 (without tax and shipping), and process most orders within 24 hours of you placing them. There are a range of shipping options for domestic customers, and they also ship worldwide within 3 to 10 business days. Visit Mt. Baker Vapor here and check out one of the top-rated online vape shops in the industry. Giant Vapes is one of the more well-known vape stores online, but it’s focus is a little more limited than many of the entries on this list. They do have a range of hardware – including sub ohm and non sub ohm tanks, regulated and unregulated mods, rebuildable atomizers, spare coils, batteries, building supplies and the usual selection of accessories – but they really shine when it comes to their e-liquid selection. The list of e-juice brands available at Giant Vapes is almost daunting it’s so long. They carry e-juice from ANML, Beantown Vapor, Beard Vape Co, Boosted, Charlie Noble, Charlie’s Chalk Dust, Cloud Company, Cosmic Fog, Cuttwood, Epiclouds, Five Pawns, Jimmy the Juice Man, Pinup Vapors, POET, Sicboy, Space Jam, Suicide Bunny, Teleos, Villain Vapors and tons more. If you’re looking for an e-juice, chances are you’ll be able to pick it up from Giant Vapes. If you’re only looking for e-liquids, Giant Vapes is arguably the most popular vapor store there is. Giant Vapes offers free shipping on all domestic orders, with first class if your order is under $75, priority mail from $75 to $250 and overnight shipping on any larger orders. They also ship orders on the same day provided it is placed before 5 pm Eastern Time on weekdays or before 2 pm on Saturdays. You can visit Giant Vapes here if you want to check out their vast selection of e-liquids. VaporBeast makes this list of the best online vape stores for its impressive range of e-liquids and hardware and its great prices. The store offers a sizeable collection of mods, with specific sections for temperature control devices, box mods, mechanical mods, unique options and handcrafted wood mods. There are also more basic starter kits and eGo-style devices available for newer vapers, and even a section for “hot and trendy” devices currently taking the vaping world by storm. The sixth best vape shop does really well for atomizers too, offering a huge selection of sub ohm tanks and more basic clearomizers, as well as rebuildable tanks and dripping atomizers. You can pick up spare coils and rebuilding accessories from the site too, as well as other accessories like drip tips, cases, lanyards and much more. They have batteries and chargers for sale too. The e-liquid selection might not be quite as big as at stores like Giant Vapes, but they still have a great selection that includes many well-known and up-and-coming brands like Cuttwood, Cosmic Fog, Dinner Lady, Glas, Jam Monster, Kilo, Mad Hatter, Naked 100, Ruthless, Space Jam, Uncle Junk’s and many more. They offer free shipping on orders to the US for any purchases over $35, and will ship the same day if you place your order before noon Pacific Time. They’ll also ship internationally to most countries around the world. Visit VaporBeast here. MyVaporStore bills itself as “the Electronic Cigarette Superstore,” and even though it’s a marketing slogan, it’s pretty much accurate. It’s easily one of the most visited online vape stores there is thanks to its impressive selection of devices and the well-designed layout of the site. You can find everything you need to get started with vaping here, ranging from the basics right through to tools, wicks and wire that only more experienced vapers will really need. The selection of mods offered by MyVaporStore is broken down by their power output (with sections for 30 to 80W and 100 to 350W devices), the number of batteries they use, box mods or pen-style devices, options with a built in battery and even ones that use the DNA Evolv chipset. There’s even a whole section for dry herb devices to meet the needs of people hoping to vape something other than e-juice, and one for “pod” style devices that are perfect for new vapers wanting something simple to use. The range of tanks, rebuildable devices and other atomizers is broken down by brand, although there are specific sections you can use to find eGo-friendly atomizers and rebuildables. These options cover most tanks on the market, with all of the major brands represented, and replacement coils are also widely available. The e-liquid selection is almost good enough to rank them as one of the top e-cig stores in the industry, with tons of juices available from a wide range of brands, including premium-style juices and even nicotine salt e-liquids that work perfectly with pod-style devices. MyVaporStore also offers free shipping on any order over $75, but only ship domestically, including Puerto Rico, Guam, the US Virgin Islands, and FPO and APO addresses. Visit MyVaporStore here. As far as online vape shops go, most are third-party companies offering a range of products from other companies which manufacture them. However, Halo Cigs makes it to this list thanks to an impressive range of own-brand devices with some Aspire devices to top off the offerings and give extra options to vapers. Halo is best known for its selection of e-juice, and there are tons of e-juice flavors available under both the Halo and Evo brands, both of which have high-VG options available too. Regardless of the type of flavors you like to vape, there will be plenty to suit your preferences available from Halo. Their devices range from the basic cigalikes through to many capable vape pens and more recently, onto mods in the Reactor series styled after Eleaf devices of varying sizes. Coupled with a wide range of sub ohm tanks and more basic clearomizer-style devices, there is plenty of choice on offer from Halo. The store also has Sony VTC5 batteries available, as well as coils and atomizer heads for your tanks. Halo will ship both domestically and internationally, with free shipping for domestic orders totaling over $75. If you think this could be the best online vapor store that focuses on their own brand, you can visit Halo here and check out what they have to offer. VaporDNA is a firm contender for the title of best place to buy vape mods, and takes third place in our run-down of the best online vape shops. The website has a massive selection of vaping gear and e-liquid, with a constantly-evolving stock list and the newest and trendiest devices always placed front and center of their store. The prices are always great and the selection is really hard to beat, and the site is easy to navigate around to find what you’re looking for. The selection of mods at VaporDNA is enough to land it on this list alone. You’ll find the most recent devices from every major manufacturer, as well as many less well known names that still put out some great devices. It’s easy to find what you want thanks to the categories, which include DNA box mods, VV/VW mods, ultra portable options and sub ohm vape pens, as well as having a “Vaper’s Chocie” section which lists recommendations from experienced vapers. The range of tanks and atomizers is also hard to beat, with tons of sub ohm tanks on offer and RDAs, RTAs and RDTAs all being well represented. Of course you can also pick up spare coils and rebuilding materials too. They also have an impressive selection of e-liquids available, from a massive range of brands and easy to browse by either brand or flavor. They also have nicotine salt e-liquids available and pre-filled flavor pods for pod-style devices. Finally, there are dry herb and concentrate devices from VapporDNA too. This is why it’s one of the best places to go if you’re looking to buy vapes online, whatever you’re hoping to vape. VaporDNA also offers free shipping on all orders over $49 going to the continental US and any overseas territories, including military addresses. They ship worldwide, although there are some exceptions relating to local laws. You can visit VaporDNA here. VaporFi is another entry on this list that focuses on its own-brand products, but it has enough variety to make it a top-rated vape shop that doesn’t carry third-party products. The VaporFi store is split up into three main sections: e-liquids, vape devices and accessories, and each one of these is loaded with excellent products suitable for everyone from newer to more experienced vapers. The e-liquids carried by VaporFi span the most common types of flavors – including tobaccos, menthols, fruits, desserts and candies – and there are also a few premium lines, with one Crafted By line including some options mixed by Cosmic Fog, and the Specialty and Grand Reserve collections. You can also custom-make your own e-juice that perfectly suits your taste and preferences. VaporFi offers a huge range of mods and vape pens, too. There are sub ohm vape pens that offer great performance in a user-friendly format and higher-resistance options that use less power and are better-suited to mouth-to-lung vaping. The online vape shop also carries mods of pretty much any type, with TC box mods and variable wattage devices being widespread, and there are also all-in-one devices that give you everything you need to start vaping aside from vape juice. The range of sub ohm tanks and clearomizers is also impressive, and there are also a couple of RDAs for any vapers looking for rebuildable devices. You can pick up tons of accessories too, including drip tips, spare parts, rebuilding tools and supplies, and 18650 batteries. Finally, VaporFi also has a growing collection of dry herb vaporizers available, most notably the Atom and the Orbit vaporizers. These are both great additions to the line-up, catering to the needs of people vaping dry herb either at home or on-the-go. There is free shipping for domestic orders with no minimum purchase, which is yet another reason VaporFi earns a spot on this list of the best vape stores online. They also ship internationally, so you can pick up vaping gear from VaporFi no matter where you live, depending on laws in your country. Visit VaporFi here. DirectVapor is our pick for the best online vape store thanks to their ever-expanding product list and always-low prices. The store offers everything a vaper could need, with loads of mods, pen-style devices, tanks, rebuildables, e-liquids and dry herb vaporizers, as well as an impressive range of batteries and accessories. It’s the best place to buy vape mods online, with a huge selection covering the most popular devices on the market that’s easily searchable by maximum power output, manufacturer, price or the type of mod. If it’s on DirectVapor, chances are you’ve found the cheapest online vape store that carries the mod. The same goes for vape pens, and DirectVapor carries everything from the most basic vape pens to sub ohm capable powerhouse devices. They also have a huge collection of dry herb devices, including portable dry herb devices, desktop units and concentrate-supporting vape pens on offer. They’re arguably the best online store for vaporizers altogether, and easily the best option that also carries traditional vaping gear. For tanks and atomizers, you’re really spoiled for choice with DirectVapor. There are sub ohm tanks from all of the big names in the industry, an impressive selection of RDAs, RTAs and RDTAs – including all of the rebuilding tools and equipment you could need – and plenty of standard tanks for anybody wanting something to use at lower power settings. Finally, the selection of e-liquids on offer from DirectVapor might not be quite at Giant Vapes-levels of variety, but there are plenty of big-name brands in the line-up to keep you happy for a long time. The range includes brands such as Alpha Vapes, Beard Vape Co, Charlie’s Chalk Dust, Cosmic Fog, Element, Flawless, Lost Fog, Mad Hatter, Milkman, Motley Brew, Mr. Good Vape, One Hit Wonder, Ripe Vapes and many more. DirectVapor offers free shipping on all domestic orders, with no minimum order amount required. On top of this, they’ll also ship your products on the same day if you order before 12 pm Eastern Time, and they also offer a price match on anything in-store if you find it cheaper somewhere else. These are all reasons DirectVapor is the best online vape shop in the industry. They also ship worldwide. Visit DirectVapor here. The best online vape stores listed in this post are all great places to pick up vaping gear, but unlike when you’re looking for the best mod or best RTA, you don’t have to exclusively pick one option. You can check all of the stores listed above when you’re trying to pick up vape supplies online, and make your decision based on who offers the best deal or the specific device you’re looking for. You might end up with a favorite place to buy vape products online, but there are always plenty of options to try out.